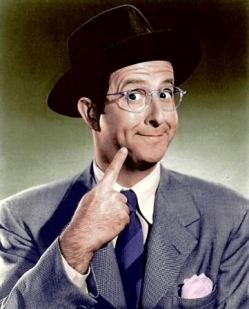 Phil Silvers (1911 - 1985) - 'From the roughest of Brooklyn's Jewish ghettos came one of the smoothest comedians of all time: Phil Silvers, loved and laughed at by pals Frank Sinatra, Judy Garland and Bing Crosby. 25 years after Silvers' death, his Sergeant Bilko TV series still crackles with a proto-Seinfeldian wit' - David Kamp. The British PHIL SILVERS Appreciation Society is an organisation dedicated to preserving and promoting the life and work of Phil Silvers, the 20th Century's Greatest Comedy Performer. The Society was officially launched on BBC Television in October 1985. 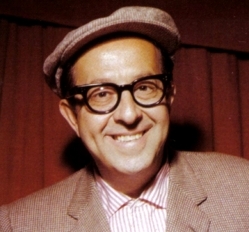 Phil Silvers generously gave his blessing to the project and as a confirmed Anglophile was delighted his official Appreciation Society would be based in the UK. In 2000 the Society was proud to be associated with the unveiling of Phil's long overdue posthumous Star on the Hollywood Walk Of Fame. 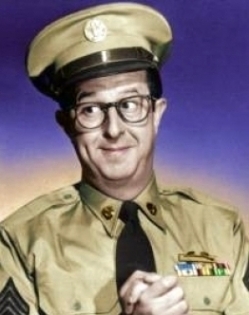 This website has been launched to perpetuate and celebrate Phil Silvers' priceless legacy. Please feel free to share your thoughts and memories on undoubtedly one of America's most cherished and loved comedy performers. Ladies and Gentlemen we give you the inimitable Mr Phil Silvers! I made many visits to my Dad’s condo in Century City. All of them with my future husband, Iren in tow. We would spend most of the afternoon into the evening listening to my Dad’s many stories. He was a great storyteller. Captivating. I can’t recall him ever repeating the same story twice. It was during the year 1984 when he was deeply moved by two young men from England who were true Phil Silvers AKA Sgt. Bilko fans. Steve Everitt and Mick Clews had asked for Dad’s permission to start a fan club. Well, being a devoted Anglophile (as he would put it) nothing would make him happier. And so, he gave them his blessing. I must say, he had a great instinct. After my Dad’s passing on November 1, 1985 there would be many communications between Steve, Mick and myself. Just one example of how lucky we are to have them representing my Dad is for fifteen years we were trying desperately to get him a Star on the Hollywood Walk of Fame. There were many celebrities who tried to accomplish this feat but it took Steve and Mick to make it happen. My Dad was blessed to have Steve and Mick as such devoted fans and to this day, I’m thankful for them. They brought much joy into my Father’s life. The British PHIL SILVERS Appreciation Society are proud to present this LIMITED EDITION bust of the legendary PHIL SILVERS. Sculpted by artist Steve Thompson this resin bust depicts Phil in his iconic role as US Army Master Sergeant Ernest G Bilko – RA 15042699, the character he played in the hugely successful television sitcom THE PHIL SILVERS SHOW. Created by the great Nat Hiken and originally called YOU’LL NEVER GET RICH the show was re-titled THE PHIL SILVERS SHOW but to fans worldwide it became known simply as SGT.BILKO.